There’s no denying that indulging in a spa treatment feels very luxurious and is a great way to unwind and pamper yourself. But you don’t necessarily have to head to your local spa in order to treat yourself to a luxurious and relaxing spa experience because you can do it right in the comfort of your own home. Here is a short and simple guide that can help you learn how to recreate that same professional spa experience right at home. You can either plan just a few treatments or make a full day of it, that’s completely up to you! Make your bathroom or bedroom as peaceful as possible by clearing away clutter. Turn the lights down low, light some scented candles and put on some relaxing music. Be sure to have some nice absorbent bath towels on hand before you begin your treatments and for an added touch of luxury, place your towels on a warm radiator. There is nothing that can melt away stress and relax you from head-to-toe better than sliding into tub filled with warm water. Add a few drops of essential oil to the running water or some gentle bubble bath in your favorite scent. Just be sure the water is not overly hot so you don’t overheat and damage your skin. When soaking in the tub, use an exfoliating brush or pad to rid yourself of dead skin cells and to revitalize your skin for a healthy glow. Pay attention to those areas of your body which often get neglected like your elbows, knees and feet. 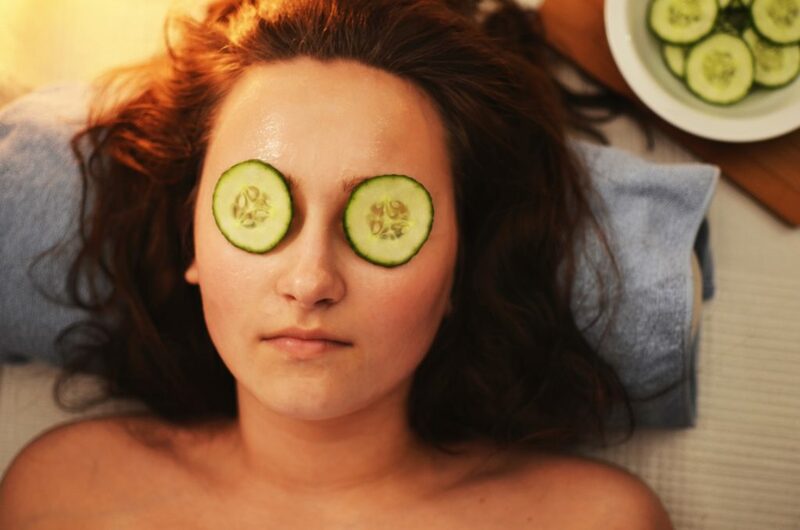 Once you’ve finished exfoliating, treat your eyes to a soothing mask of cotton wool pads soaked in chamomile tea or slices of cucumber which are both cooling and refreshing. When you’ve finished relaxing and soaking in the tub, it’s a good idea to shower off with slightly warm water to rid your skin of debris and to close the pores. You can also wash your hair while showering, using a good quality shampoo for your hair type, followed by an intensive moisturizing conditioner. Then step out of the shower and grab that warm towel to wrap around yourself. Use another towel to wrap around your hair. Sit down comfortably on a chair or stool and spend a few minutes moisturizing your body with a rich cream like cocoa butter. Not only will it feel amazing, but it will also provide your newly-cleaned skin with the moisture it needs, leaving it soft and glowing. But because you’re about to apply a chemical peel to your face, skip moisturizing your face. Once you’ve finished moisturized your skin and are dressed comfortably, treat yourself to a chemical peel. A peel can do wonders for improving the texture and appearance of your skin and can serve as a solution for common skin problems like acne scars, light wrinkles and hyperpigmentation. Use a high quality Dermalure chemical peel that’s been designed specifically for your skin type. If you’re new to peels, choose one featuring a milder strength acid so no more of the top skin than necessary will be peeled away. Then simply follow the instructions on the packaging to revitalize, nourish and refresh the skin on your face. As you can see, it’s easy to create a spa atmosphere right in the comfort and privacy of your own home! Whenever you’re feeling stressed or in need of some pampering, just follow all or some of the steps above to help you feel renewed and refreshed both on the inside and out!